1 of 3 In a medium saucepan, bring 2 cups water to a boil. Add rice and reduce heat to medium-low. Cover and cook for 45 minutes. Remove to a bowl. 2 of 3 Whisk sugar and cornstarch into same saucepan. Add milk, stirring until smooth. 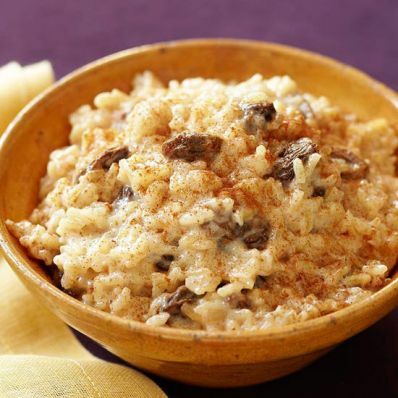 Stir in cooked rice, raisins, cinnamon, salt and nutmeg. 3 of 3 Bring to a boil over medium-high heat. Reduce heat and simmer, stirring occasionally, 10 minutes. Let cool slightly before serving.